Since the October 2016 opening of Dolphinaris Arizona, a swim-with-dolphins tourist attraction in the desert near Scottsdale, four of its eight dolphins have become ill and died. Animal welfare organizations and activists have been opposed to Dolphinaris Arizona ever since it was in the planning stages. The desert is no place for captive dolphins, especially since the stress of being in captivity makes them more susceptible to valley fever, a deadly fungal disease. More than 166,000 people have signed a Care2 petition urging the facility to release its surviving dolphins. 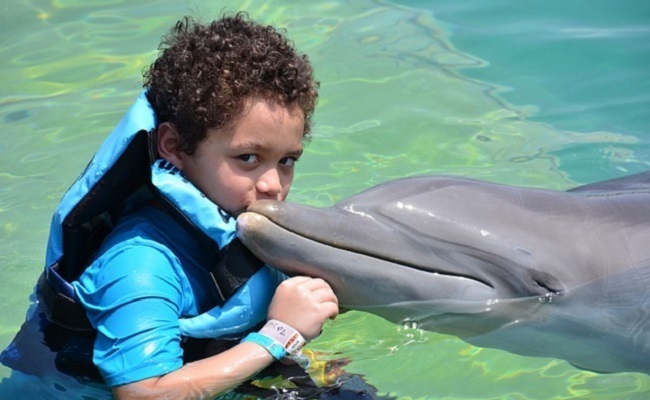 After the death of the fourth dolphin, Kai, on January 31, Dolphin Quest, a Hawaii-based company that loaned some dolphins to Dolphinaris Arizona, announced it has terminated its animal loan agreement with the tourist attraction. Two of the surviving dolphins that belong to Dolphin Quest, Noelani and Liko, will be returned to the company (probably via FedEx, which shipped the dolphins there in the first place). That request has apparently been granted. Dolphinaris Arizona is closing. Unfortunately, it’s only on a temporary basis while “an outside panel of experts reevaluates the facility, environmental factors, and all aspects of animal welfare at the facility,” the tourist attraction announced on February 5. During the closure, the remaining two dolphins will be taken to “another licensed U.S. facility,” according to the announcement. “We hope to find a long-term solution for the welfare of our dolphins,” General Manager Christian Schaeffer de Leon said in the announcement. Here’s hoping those experts determine that the only long-term solution is to permanently shut down Dolphinaris Arizona and to free those two dolphins from captivity. Moving dolphins to the desert is a “failed experiment,” stated Patricia Cady, co-founder of Dolphin Free AZ, a group that has long opposed Dolphinaris Arizona and has organized many protests against it. Cady is asking the Salt River Pima-Maricopa Indian Community Tribal Council, which owns the land on which the tourist attraction is location, to revoke its land-lease agreement with the company and to commit to not allowing dolphins there again. Although the two dolphins returned to Dolphin Quest are now out of the desert, they may not be out of the woods, figuratively speaking. The company provides dolphins to other tourist attractions, so Noelani and Liko will likely remain in captivity. Swimming with dolphins may be fun for the human participants, but it’s stressful for dolphins. It can lead to behavioral abnormalities, illness and lowered resistance to disease and death, according to Whale and Dolphin Conservation, a leading charity dedicated to protecting these marine animals. It was for these reasons that TripAdvisor made the compassionate decision three years ago to stop booking tickets to attractions that allow people to interact with captive wild animals. It’s time for more companies, like Dolphinaris and Dolphin Quest, to follow TripAdvisor’s lead and stop exploiting captive animals for profit. Good news, hope they close down all of these so-called "attractions" dolphins don't belong in captivity let alone in such an unsuitable environment!